We have arrived in Bhutan..
We will apparently have the guide, bus and driver for the duration of our stay. Our first stop was a 14th century chain bridge which took all my courage to cross. As I started across, I really wished I had done my shoes up properly. My sanity was not improved by Dave running back across in the opposite direction, bouncing the heck out of the whole thing. The bridge was made from 3 huge chains with links about 6″ long. There were a couple of lengths of rebar running parallel to and between the chains. Chain link fencing surrounded the chains and rebar, making up the floor and sides. Luckily there were two bridges across the river so I came back on the one that had a plank floor. Dave got on behind me and bounced it like crazy but the illusion of stability provided by the solid floor carried me through, and I managed to scoff at his attempts to scare me again. We had a nice lunch and checked into a great hotel. 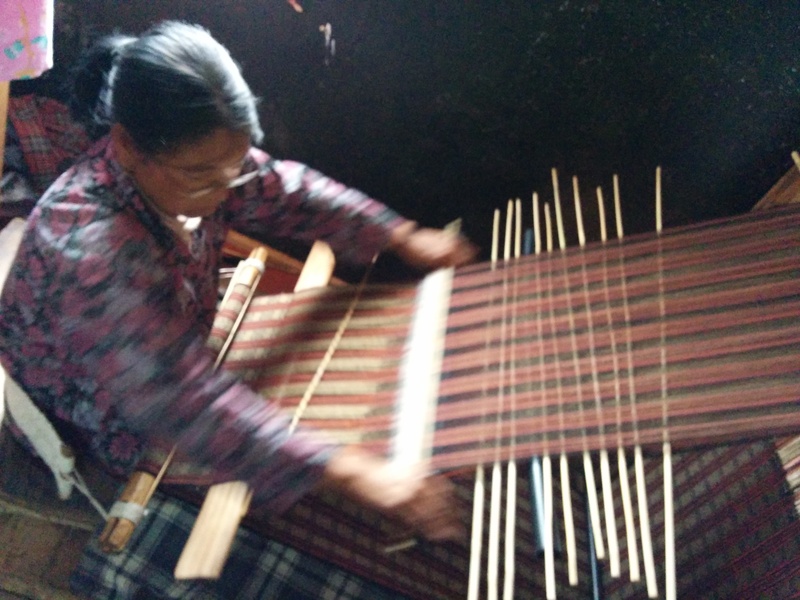 In the afternoon we visited a weaving place. They were doing really great backstrap weaving. We watched for a while then returned to town and walked around for an hour or so. This entry was posted in travel and tagged Bhutan on December 12, 2014 by gillianknitter.